Ulavacharu is made with ulavalu. 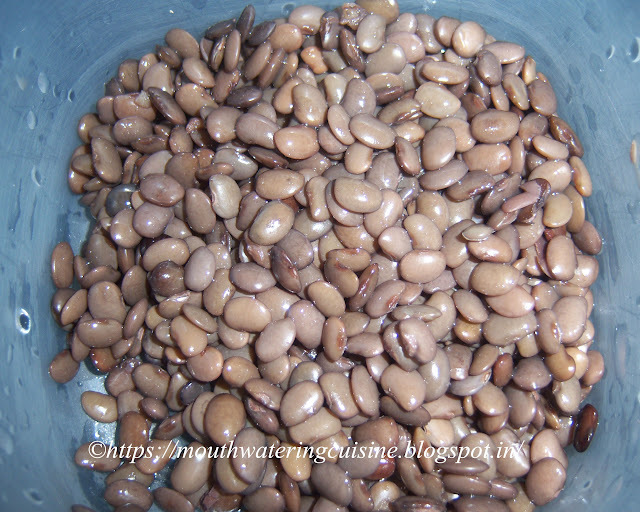 The whole seeds of horse gram are generally utilized as cattle feed. 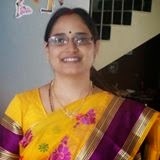 In Telangana and Andhra Pradesh, they are prescribed to persons suffering from jaundice or water retention, and also useful for weight loss diet. It is considered helpful for iron deficiencies, and is considered helpful for maintaining body temperature in the winter season. 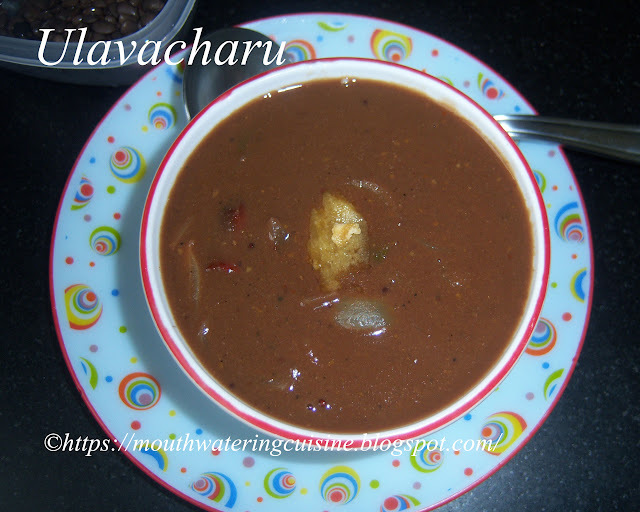 It is served in most of the Telugu speaking people's weddings and ceremonies and tastes wonderful with boiled rice. The best accompaniment to this dish is rich fresh cream. Normally it is made in huge quantities only. We can store this for a month period also. We need to soak them and then only cook. Normally they are cooked on traditional wooden stoves and the vessels used are thick bottomed wide ones or pots. But now a days we do not have such kind of stoves, so we cook them in normal stove top only. We can use thick bottomed vessels or even pot to cook this, though I used my 3 ltr Prestige pressure cooker. It needed to be cooked till we get the right consistency. Soak ulavalu over night or for eight hours. Pressure cook them for 5 to 6 whistles. Let the pressure goes off. Drain them and collect boiled water. 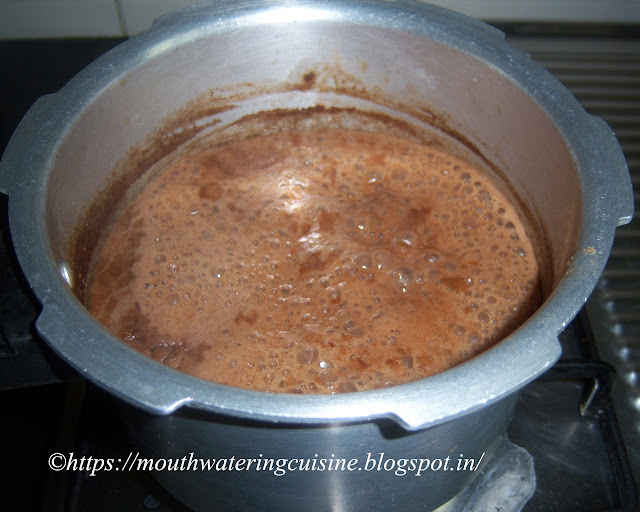 Grind half portion of horse gram or ulavalu to make a smooth paste. Soak tamarind and extract the juice. Cut onion into six parts. Heat oil in a thick bottomed vessel, (I used small size pressure cooker) add mustard seeds, cumin seeds and red chilli. Allow them to splutter and add onions and garlic. Fry them for a second. Add tamarind extract, slat and turmeric powder. Let this come to a boil. Add drained ulavalu water and grounded paste to it. Let it boil for 30 minutes or till it become thick like soup. Add curry leaves and jaggery. 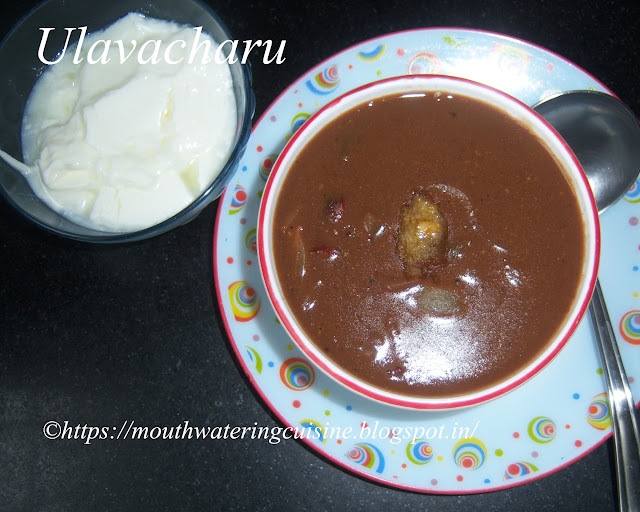 Serve this hot ulavacharu with rice and fresh cream or curd. For more Dals and Soups click here.Thank you for visiting my blog. Hope you liked all my recipes. Any feedback and comments are appreciated.